GMR Marketing, the nation’s largest event marketing company, is launching an event at the Northeastern University for a leading telecommunications provider. We are looking for a team Brand Ambassadors to network and create awareness for a 4-day event in the beginning of the semester. When: Ambassadors will be required to work up to two weeks prior to the start of the semester. If interested in this position, please email your resume to cziller@gmrmarketing.com, answer the questions below, and be considered today. Don’t miss out on this opportunity! • Why do you want to be chosen to work for GMR Marketing? • How does your involvement with organizations on- campus make you the best candidate? • How are you influential with your social media, and your personal brand? Making it Though the Co-op Process: Keep Those Contacts! After you’re all done interviewing and you have a fabulous co-op to be excited about, don’t forget about the contacts that you made throughout the entire interview process. Chances are, you interviewed for multiple positions and either turned offers down, weren’t offered every co-op you interviewed for, or didn’t hear back from a company soon enough. However, these different company representatives that you met with throughout the co-op search could become useful contacts for you at some point in the future, and you’ve all heard it before…networking is everything! A great idea is to take the pile of business cards that you collected throughout the process and type up the contact name, phone number, and email from each company onto a Word document so if you ever want to contact them in the future, you have a point of reference all in one place. Plus, then you don’t need to hang onto all of those business cards! You never know- you may want to try again for a co-op you didn’t get this time around. I hope these tips have helped make the process of finding a co-op a whole lot less daunting and that you end up with an amazing co-op! My final piece of advice: stay involved with NUPRSSA- we’re all here to support each other and share our experiences. The NUPRSSA executive board would like to thank Courtney for sharing all of these extremely helpful tips with us this semester. We know we all took a few notes from her; we hope that you did too! Courtney’s back to share another tip on making it through the co-op process! Since you only get 3 co-ops and you want to make each one count, it’s easy to become a stress-case in the search for the perfect co-op. Although being nervous about it shows that you care, it is crucial that you don’t let the co-op search get the best of you. First of all, stay calm and know that the co-op process is more about timing than anything else. Unfortunately, not all companies call for interviews at the same time, and you may have to decide if you’re willing to turn down an offer in the hopes that you’ll get called for your top choice co-op. Yes, these choices are extremely stressful (trust me, I know!) but in the end, everything will work out and you just have to weigh your options. I think it’s best to have a few top co-op choices instead of just one, so if timing doesn’t work out or you have a rough interview, you can still be happy with the co-op that you end up choosing. Keep in mind that not only is the company helping you by giving you a job but YOU are helping them by working for them. Be confident in what you have to offer them, even if you’re nervous, so that the interview goes well and you feel better overall. In our field, sometimes it’s your personality that gets you the job, not your qualifications! If the conversation during the interview is all personal, it’s up to you to show the employer that you’re serious about the job and get the conversation onto a professional level. A good interviewer can find any reason to talk about how their skills relate to the qualifications necessary for the job position. In the end, know that you will get a co-op, and timing will effect which one you end up with. You get to decide which co-ops you accept and don’t accept, so make sure that the decisions you make are what is best for you! Check back soon! Courtney has one more useful tip to share with us! It’s very uncommon in today’s world to find a brand that isn’t on some sort of social media platform, whether that be Facebook, Twitter, Instagram, or any other website that helps a brand interact with its customers. It is, however, somewhat rare to find brands that do social media right. Customers who engage with companies over social media spend 20% to 40% more money with them, so it’s essential for brands to have a killer social media strategy. A brand’s strategy should be customer-centered, conversational, unique, and influential. Here are a few brands that we think have awesome social media presences! Remember last fall when a man named Felix Baumgartner free fell from 23 miles above the surface of the Earth? If you do, then you’ve seen a great example of RedBull’s social media strategy. Since RedBull’s tagline is “gives you wings,” they stay true to that message by sponsoring many athletes in extreme sports. These videos of extreme athletes, like Felix’s, are constantly being liked and shared and talked about on sites like Facebook, Twitter, and Reddit, making them some of RedBull’s most popular posts. RedBull’s branded content creates something that people want to watch and share but at the same time something that fits with the core values of the company’s brand, and this is their key to success. 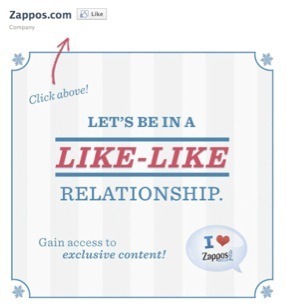 Zappos.com’s social media strategy is all about putting their fans and customers first. They use engagement strategies such as the “Fan of the Week” contest, where fans send in photos with their Zappos boxes and everyone gets to vote on the best photo of the week. Their catchy saying is “Let’s be in a like-like relationship,” which shows that they value their customers and view their potential fans as equals. Chipotle’s goal is to change the way people think about their food. They make it a point to source ingredients from local farms that exhibit positive behaviors toward animals and the environment and their social media presence remains loyal to this philosophy. Additionally, they respond to 83% of Facebook posts and 90% of their tweets are responding to customers. Most importantly, though, is that they don’t only answer positive comments, but they try to help when something is wrong, too. Chipotle truly values conversation and getting to know and create loyal customers. Intern Sushi is looking to hire influential, well-connected and sharp students. To apply, please email your cover letter and resume to Alexandra. We’re excited to announce that this Wednesday we’ll be hosting a joint event panel with the Entrepreneurs Club and IDEA titled #trending: Social Media Marketing. We’ll have a great group of speakers and some of the greatest innovators in social media marketing in the Boston area! Come prepared to use our hashtag #trendingNU to ask our panel questions. Refreshments will be provided. Wednesday, March 20th from 6:30 PM – 7:30 PM in International Village room #19. For more information, check out the event page! PR has such a fabulous reputation, and rightly so. The glitz and the glam of pitching beauty products or dealing with celebrities is extremely enticing. So much so, that I had never even considered the other types of public relations out there in the world. At a PRSSA meeting this past fall, Metis Communications came in to speak about tech PR. I recognized the name from past meetings as well as from the list I was building for potential co-op choices. I was hesitant about applying, wanting to ensure that this whole “tech thing” wasn’t going to bore me to tears. After hearing how cool Metis sounded, I realized that the fact that is a tech PR firm shouldn’t hold me back. So there I went, on my leap of faith, accepting the challenge that stood before me. But that’s what co-op is all about, right? It’s all just one big learning experience. Well here I am, four months later and two months into my co-op. In a mere two months, I went from barely knowing how to use my iPhone, to pitching reporters using words that used to give me a headache: cyber security, big data, cloud computing, etc. I’m seriously impressing myself with this newly found knowledge I never believed I was capable of (come on, ask me about cyber security), and I am so proud of myself for trying something new and different. Bottom line: Yes, PR is fabulous. No wonder it’s such a fast growing industry – it’s rewarding, exciting, fast paced, and well…fun. But I believe the key to being successful in this career is being open-minded. By being able to avoid pigeonholing yourself into one type of PR, you can allow yourself to grow and offer the most to the industry. Doesn’t this all sound good? Do you want the awesome co-op experience I’m having? Well…it can be yours. Metis is looking for fall co-ops, so take a chance and apply. You won’t regret it.